72 Вт⋅ч литий-полимерн., Автономная работа (сведения производителя): 540 час. Лучше некуда. Последнее поколение MacBook Pro приятно удивляет большим временем работы от аккумулятора, высокой производительностью и качественным экраном Retina с разрешением 2560 на 1600 точек. The 13-inch MacBook Pro Retina starts at $1,299 with 4GB of RAM and 128GB of storage, but many users will want to go for the next level up with a faster processor, 8GB of RAM and a 256GB hard drive selling for $200 more. Students can find this notebook for $100 off through the education store. A refurbished base level model sells in for $1,099. Our review machine cost $1,799 and comes with a slightly faster 2.6GHz Intel Core i5 processor, 8GB of RAM and a 512GB SSD. That hits the sweet spot for value and enough storage to hold my library of video and photos plus programs. If you can live with the storage situation, or at least don't mind paying more upfront for a bigger SSD, then the Retina MacBook Pro is still one hell of a laptop. If you aren't as worried about having a razor-sharp screen or pro-level performance, then the 14 percent lighter MacBook Air will probably be the better buy. And if you can wait a few months, there's also a chance that we'll see the MacBook Air finally get a high-resolution display. That's a big and unconfirmed "if," but some rMBP buyers could end up kicking themselves if Apple indeed launches a Retina MacBook Air later in 2014. But if, right now, you want a terrific MacBook with an amazing screen, smooth software, pro-level power and excellent battery life? Well, then there are much worse things you could do with $1,300. This is an expensive – but outstanding – laptop. Jon’s got three of the best ultra portable laptops on test, but can Apple’s 13-inch MacBook Pro with Retina display beat out the others on test? See for yourself in the video above! It’s incredibly tough to find fault with the new MacBook Pro. There’s power aplenty, great battery life, a class-leading display and – thanks to Intel’s Iris GPU – the graphics performance the Retina display always deserved. Gram for gram, we can’t think of a laptop that delivers so much. The MacBook Pro 13in with Retina display is the best laptop money can buy. The 2013 MacBook Pro 13" is an excellent laptop with a beautiful screen and extra-long battery life. Our biggest regret is that there's no dedicated graphics card, although the Iris 5100 will handle a certain amount of gaming. Plus, this year's MacBook Pro costs a couple hundred pounds less than last year's. We’re getting a bit tired of Apple getting everything so utterly, utterly right, like the annoyingly swatty kid in class who never makes a mistake. As with the 2013 Air, the Pro judiciously shifts everything upwards ever-so-slightly, adding slightly better components that result in a tangible performance boost, while keeping the best bits (the screen, the design) much the same. Even the reduced price tag is perfect. The 13-inch MacBook Pro packs a stunning, high-resolution display, decent battery life and plenty of power into a slender, sturdy body. If you like the portability of the Air, but need more power, it's a solid option to consider. If you're a professional video producer, the extra power and discreet graphics of the 15-inch Pro will be a welcome upgrade. Apple's latest 13" MacBook Pro is a force: it offers a fantastic display, excellent processing power, decent graphics and very good battery life in a $1,299 package that competes strongly with Windows laptops in the same price range. For those who need more processing power than an Ultrabook offers, the latest Pro 13" packs that punch yet it's as light and compact as an Ultrabook. If portability is your main priority, then the MacBook Air or one of the many Windows Ultrabooks will be a better choice. However, the 13-inch MacBook Pro With Retina Display will appeal to users who need a more powerful desktop-replacement system that can handle demanding tasks such as photo-editing or video presentations. The MacBook Pro 13in doesn’t have the longest battery life - this honour belongs to the 13in MacBook Air (12 hours). It’s not the most powerful Apple laptop either, this title goes to the 15in MacBook Pro. The MacBook Pro 13in doesn’t have the longest battery life - this honour belongs to the 13in MacBook Air (12 hours). It’s not the most powerful Apple laptop either, this title goes to the 15in MacBook Pro. All in all, the MacBook Pro 13in RD is fairly decent machine in terms of performance, but I’m not convinced that this form factor is appropriate for the Pro moniker. Pro suggests it’s for folk who know what they’re doing and do pros really want to buy into something that’s about as upgradeable as a mobile phone? Evidently, the company was listening to its users back then. Will Time Cook’s Apple be listening to make some crowd pleasing changes? We might be surprised, but in the meantime, don’t hold your breath. The question here isn't whether the MacBook Pro is better than the 2012 model or whether it stacks up against the 15-inch version - which has also recently upgraded to include the intel Haswell processor - but whether it makes more sense than a MacBook Air. The crux really is likely to come down to how much travelling you do. If you are on the road without easy access to power then you should stick with the Air. If this is a laptop for the home and little else, you'll enjoy the power the Pro brings and the screen resolution too, knowing full well that a power socket is never that far away. In the case of the 15-inch MacBook Pro Retina it's clearly business as usual for Apple, yes the reductions in size are impressive, but when you take into account the fact that pricing for 15-inch model starts at £1,699 this is clearly a product that will be either a treat for some, or a necessary expense for others. The 13-inch model, however, is where things begin to get really interesting. In the past, the original 13-inch MacBook Pro Retina would have cost you £1,449 for the 128GB model, and in return you paid for something that was cutting edge. That said, the MacBook Pro Retina strikes an admirable balance between the two. There’s no reason the laptop couldn’t be your everyday workhorse, so long as you don’t regularly engage in seriously CPU-intensive tasks. It’s not the most powerful laptop. And it’s definitely not the most portable. But the combination of a capable processor, an amazing display, a light and slender form factor, and respectable battery life, secure the MacBook Pro’s position as one of the top notebooks on the market right now. It’s incredibly tough to find fault with the new MacBook Pro. There’s power aplenty, great battery life, a class-leading display and – thanks to Intel’s Iris GPU – the graphics performance the Retina display always deserved. Gram-for-gram, we can’t think of another laptop that packs this much potential. 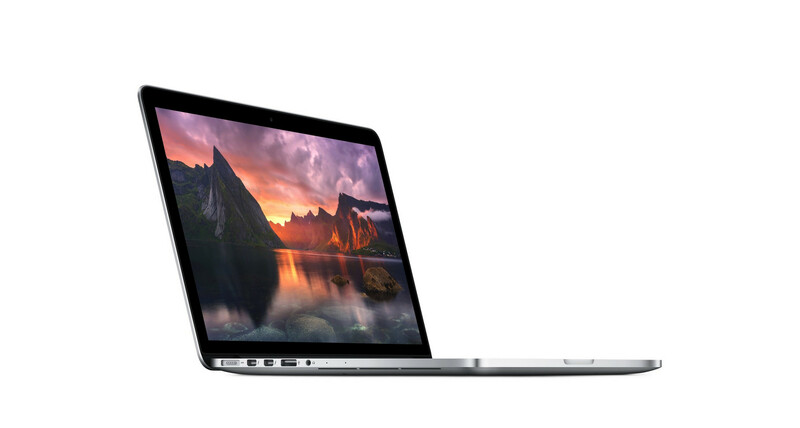 Right now, the MacBook Pro 13in with Retina display is the best laptop money can buy. Last year’s 13-inch MacBook Pro with Retina Display was a bit of an odd duck. There are other high-res laptops out there, but this year’s more powerful and affordable 13-inch Retina MacBook Pro is one of the best of the bunch, and makes a compelling case for upgrading from the 13-inch Air. On paper, the new 13-inch MacBook Pro with Retina display looks like a marginal upgrade: a CPU refresh with some slight changes to the weight and dimensions. But thanks to a lower starting price, faster SSD speeds and a big leap in battery life, it's actually a much, much better deal than it was a year ago. Apple's dominance is almost getting boring. The refresh of the 13-inch MacBook Pro with Retina Display once again keeps it one step ahead of other ultraportable notebooks. Not only does this machine offer one of the best displays and better performance, but its battery life is also the best in its price range. The MacBook Pro 13 banishes any questions about its place as king of the ultraportable market. While there are some ultrabooks which match its display, battery life or performance, there are none that can do all three, and those that try (such as Dell’s XPS 13 with 1080p display) are actually more expensive. Intel Iris Graphics 5100: Видеокарта класса GT3 (без eDRAM) с 40 исполнительными устройствами, встраиваемая в некоторые низковольтные процессоры Haswell. Вторая по мощности в своем поколении. Они позволяют запускать некоторые нетребовательные современные игры. Впрочем, производительности данных видеокарт более чем достаточно для обычных офисных задач и просмотра HD-видео. Плюсом интегрированных видеокарт обычно является наибольшее достижимое время автономной работы использующих их ноутбуков. 4258U: Низковольтный двухъядерный процессор, основанный на архитектуре Haswell, с базовой частотой в 2.4 ГГц и возможностью ускорения до 2.9 ГГц в режиме Turbo Boost. Оснащен встроенной видеокартой Iris Graphics 5100 и двухканальным контроллером памяти DDR3.